We’d love your help. Let us know what’s wrong with this preview of Defectors by Joseph Kanon. To ask other readers questions about Defectors, please sign up. Rosemary A. It is about family and what you do for them. Simon Weeks comes to Russia to help his infamous brother put the polishing touches on his autobiography. It is 1961 and in 1949 Frank defected from the United States to Russia after he is exposed as a communist spy. He betrayed everything, everyone he ever knew. His wife and son dutifully come with him, but it is obvious to Simon that no one is happy. Frank;s wife, Joanna, is self-medicating every day with copious amounts of alcohol. Frank is still charming, manipulative, secretive, and a schemer. As always it is hard to know what is really going on in Frank’s head. As part of the deal to come over to Russia, Simon has to check in with the CIA at the embassy every day. Simon quickly finds himself caught between the CIA and the KGB in a game where the rules bend, twist, and even break. He knows Frank well enough to know that he will lie even to his brother if it gains him an advantage. As the plans come together to bring Frank, Simon, and Joanna out of the country it becomes more and more apparent that the motivations of all involved are as murky and unfathomable as Stalin’s brown eyes. Moscow is a city of informants. ”The whole country full of them, the women in the hotel hallways, the listening chandeliers, the men plotting in the Kremlin, Stalin feeding on his own, check mark by check mark, a city without maps.” Simon is learning quickly how things work, but the question remains whether he can learn it fast enough while he tries to uncover Frank’s true motivations. I’ve really enjoyed the Joseph Kanon books I’ve read. He writes the kind of spy novel that is like mainlining top shelf vodka right into the pleasure center of my mind. In his books he shows the gritty side of betrayal along with the truly heroic moments when someone is willing to make the ultimate sacrifice for his country. He explores the ideas of what is the best thing to do? And how does one determine that? What is acceptable to insure a certain outcome? Who can be trusted under what circumstances? So sling that trenchcoat over your shoulders and pull that black fedora down low on your forehead and enter the world of Moscow defectors. Tell lies to match their lies and walk softly. In 1949, Frank Weeks, agent of the newly formed CIA, was exposed as a Communist spy and fled the country to vanish behind the Iron Curtain. Now, twelve years later, he has written his memoirs, a KGB- approved project almost certain to be an international bestseller, and has asked his brother Simon, a publisher, to come to Moscow to edit the manuscript. It’s a reunion Simon both dreads and Frank both dread and long for. Firstly the book has a terrific sense of time and place and you feel and see Moscow in the 60s. I really enjoyed the journey for the scenery but somehow the story and the characters lacked any real punch for me. While it was a short book it dragged in places and while the last third picked up pace it just seemed a little late for me. A master of the technical spy thriller! It is usually a difficult task to find a well written spy thriller these days - don't get me wrong, there's a plethora of great mystery/thriller writers around creating masterpieces every which way you turn but a mystery/thriller with a large aspect of the plot surrounding politics & espionage, is sometimes an impossible task. Fear not! Joseph Kanon is here with exactly what you desire. Due to the majority of books that class themselves as 'spy thriller A master of the technical spy thriller! It is usually a difficult task to find a well written spy thriller these days - don't get me wrong, there's a plethora of great mystery/thriller writers around creating masterpieces every which way you turn but a mystery/thriller with a large aspect of the plot surrounding politics & espionage, is sometimes an impossible task. Fear not! Joseph Kanon is here with exactly what you desire. Due to the majority of books that class themselves as 'spy thrillers' being pretty abysmal, I go into reading these novels with a degree of resignation, though now, thanks to Mr Kanon my faith has been somewhat restored. His previous bestselling novel Leaving Berlin falls into the same genre and was done excellently, I really needn't have worried about Defectors as he has already proven his worth as a technically brilliant master of the epic espionage adventure! In a genre where the books tend to be either awful or magnificent, with absolutely no middle ground, Kanon is a breathe of fresh air and someone you can trust to fill out a novel with superb detail, after all he is a bestselling author for a reason! Defectors is enthralling and captivating from the first page and through his vivid descriptions, I felt as though I was right there. The relationship between the two brothers and what they go through together is a common thread throughout the whole book. A truly thrilling tale of espionage and betrayal against a historical backdrop. If you are a fan of political spy thrillers please read both Defectors & Leaving Berlin, I cannot praise his writing enough. It is true intelligent literary fiction with lots of pleasant historical detail and family relationships - how they evolve along with the circumstances. I will certainly be awaiting his next book with anticipation. It's rare that an author can make this kind of impact on me having read just one of their novels. A KILLER IN THE ESPIONAGE GENRE - THIS WILL KNOCK YOUR SOCKS OFF! TRUST ME ON THIS ONE. The disappearance of British diplomats Donald MacLean and Guy Burgess in 1951 and the subsequent revelation in 1956 of them as defectors to the Soviet Union shocked the world and has subsequently provided fodder for a virtual cottage industry of spy novels. Only much later did it come to light that MacLean and Burgess were just two of the notorious Cambridge Five. Both men make cameo appearances in Joseph Kanon's terrific new spy novel, Defectors. The book opens in Moscow in 1961, where an Ameri The disappearance of British diplomats Donald MacLean and Guy Burgess in 1951 and the subsequent revelation in 1956 of them as defectors to the Soviet Union shocked the world and has subsequently provided fodder for a virtual cottage industry of spy novels. Only much later did it come to light that MacLean and Burgess were just two of the notorious Cambridge Five. Both men make cameo appearances in Joseph Kanon's terrific new spy novel, Defectors. The book opens in Moscow in 1961, where an American publisher named Simon Weeks is just arriving to visit his notorious brother, Frank. Twelve years earlier Frank had defected to the Soviet Union and became "the man who betrayed a generation." Now he is writing a memoir that Simon's firm will publish. Unaccountably, the KGB has granted Frank permission to write and publish the book. Simon and Frank are the sons of a former senior New Deal official. They're descendants of an eminent old New England family. Both are Harvard-educated because Harvard was, like so much else, a Weeks family tradition. Through childhood and adolescence, Simon idolized his older brother. He followed Frank to Harvard and then into the OSS in World War II. Now, the anger he felt when Frank defected in 1949 is surfacing again. Because of obvious omissions in the manuscript he received, Simon wonders how much of the truth Frank is telling. After all, as Simon learns very quickly, Frank remains a dedicated and active KGB officer, as he is quick to point out. But Simon can't afford not to publish the book, which clearly will be a huge bestseller. Defectors is a fascinating glimpse behind the Iron Curtain, specifically the Soviet Union, in the 1960’s. Simon Weeks is making an unprecedented visit to the U.S.S.R. to visit his brother Frank, an individual who defected from the U.S. to the Soviet Union in the early 1950’s. Frank has been given permission by the Soviet government to publish his memoirs, and his brother Simon is a bigwig at a publishing company that has agreed to handle the publication. As Frank cannot leave his adopted country Defectors is a fascinating glimpse behind the Iron Curtain, specifically the Soviet Union, in the 1960’s. Simon Weeks is making an unprecedented visit to the U.S.S.R. to visit his brother Frank, an individual who defected from the U.S. to the Soviet Union in the early 1950’s. Frank has been given permission by the Soviet government to publish his memoirs, and his brother Simon is a bigwig at a publishing company that has agreed to handle the publication. As Frank cannot leave his adopted country, Simon must travel to Moscow to interview Frank and complete the memoir. As soon as Simon arrives, he realizes that Frank has other greater plans afoot, and the treachery and betrayals begin. While I enjoyed the entire book, the best parts of this book by far were the descriptions of the lives of the American and British defectors in Moscow during this time period and 1960’s era Moscow itself. Stalin had only been dead for 8 years, and life as a Soviet citizen was restrictive and full of shortages and fear. The defectors are not treated as they had expected to be, and the Soviets employed all manner of spy techniques to keep an eye on these individuals. If you like spy novels, I recommend picking this one up. His writing is a little different, and it took me a bit to get used to. Once I did, I really enjoyed the book. Thanks to Atria Books and NetGalley for the chance to read this ARC in exchange for an honest review. Defectors is set in 1960's Moscow where ex-CIA agent Frank Weeks, a notorious defector to the Soviet Union, wants to publish his memoirs. Frank’s brother, Simon hasn’t seen his brother in more than ten years, but he comes to Moscow to assist in its publication and to learn why Frank chose to betray his country and his family. Kanon always captures a great sense of time and place in his descriptions of 1960’s Moscow. If you’re expecting high octane action, forget it, but if you’re after a powerful cerebral espionage novel you’ve come to the right place. With a great cast of fellow defectors, including Frank’s wife Joanne we discover there’s more to the story than meets the eye leading to a great finale. It’s difficult to mention much without a spoiler, but it’s safe to say that Kanon is a great espionage writer and this book is a worthy addition to the genre. I don't mind a good spy story every now and then, but I found The Defectors by Joseph Kanon to be only adequate. I found myself skimming parts that didn't hold my interest. An'okay 'read at best. Thank you to Simon and Schuster Australia via Netgalley for providing me with a digital copy of The Defectors for review. All opinions expressed in this review are entirely my own. 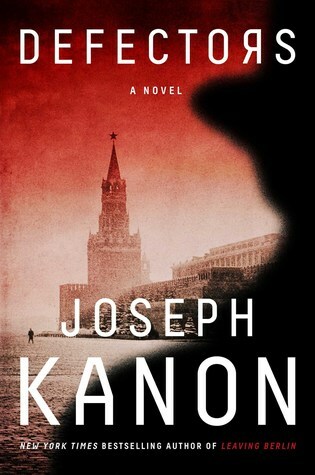 All of Joseph Kanon's books are intelligent literary thrillers/historical fiction, and every one is great. But his latest book, DEFECTORS, is outstanding. In 1961 a publisher, Simon, travels to the Soviet Union to edit the "memoir" of a former US citizen who defected to Russia in 1949--his brother, Frank. "Memoir" is in quotation marks because the truth of that book is suspect. The truth of anything Frank says is suspect. So, when Frank tells Simon he wants to return to the US but can only do so w All of Joseph Kanon's books are intelligent literary thrillers/historical fiction, and every one is great. But his latest book, DEFECTORS, is outstanding. So, when Frank tells Simon he wants to return to the US but can only do so with his help, Simon is on his guard but cannot refuse. I will spare you further details so you can enjoy discovering them on your own. And you will. Partly, that's because every word counts in this novel. Kanon never goes on and on with unnecessary descriptions, tempting his readers to skim, as so many authors do. Kanon never wastes his readers' time. Love for your country vs Love for your family. In Defectors, loyalty to ‘the cause’ is stronger than the loyalty between brothers. After Frank Weeks defected, he’s now about to publish his memoir and that sees him reunited with his brother, Simon. The relationship between the two brothers is rocky to say the least, but as they spend time together and reminisce about their childhood and the mistakes of their past, you begin to wonder if their brotherly bond can be repaired when Frank makes a surpr Love for your country vs Love for your family. My knowledge of Moscow in 1961 is zero to none, I know zilch about the KGB and before reading this book I didn’t even know what defecting was. And you’ll be happy to know, none of that affected my enjoyment of this book, in fact it made it all the more enjoyable because not only did I learn something but I am now fascinated with what motivates someone to defect. Marked as an intelligent thriller, I like to use the term ‘silent thriller’, there isn’t heaps of action and events move quite slow at times but the thrill is there, in the silent suspense – can Simon trust Frank as he reveals his plans? At times, I thought the pace of the story was extremely slow and it seemed like nothing was happening at all, but like a spy [shh, I believe I have the necessary skills to be a spy], I learned to look for clues in these quiet moments, and despite my skills of detection, I still wasn’t able to predict the clever way this story ended. Now I see why this is referred to as an intelligent thriller, what a clever plot twist. I liked that Frank’s wife was incorporated into the story and we see how Franks actions affected her, both in the past and the present. Defectors has a little emotional thread to it too as you see a family pushed to its limits due to lies, secrets, betrayal, and more secrets. This feeling is heightened as at times Frank appears quite cold and this causes you to become even more suspicious of his end game. Kanon added a thick emotional layer to this spy novel that shows that you don’t always need a fast pace and a ton of action to captivate the reader. Those who enjoy spy novels will definitely like this book. Good intrigue and a rather unexpected finale. 'Defectors', Joseph Kanon's latest, continues his long winning streak of intelligent, atmospheric thrillers. I don't think there's another writer better than Kanon in evoking time and place through writing technique (although Alan Furst is no slouch in that regard...), and when you combine great prose with an intricate, thoughtful plot, you have a great book. I've loved literally every one of his novels and Defectors is another fine effort. Defectors is the story of a publishing guy whose brother 'Defectors', Joseph Kanon's latest, continues his long winning streak of intelligent, atmospheric thrillers. I don't think there's another writer better than Kanon in evoking time and place through writing technique (although Alan Furst is no slouch in that regard...), and when you combine great prose with an intricate, thoughtful plot, you have a great book. I've loved literally every one of his novels and Defectors is another fine effort. Defectors is the story of a publishing guy whose brother had defected to Russia with CIA secrets after WWII. Several years have passed and the defector wants to tell his story. Who better than his brother to help him get it out there in the American market? The problem is that he's in the communist Soviet Union and his brother needs to travel to Moscow and endure all of the scrutiny reserved for non-believing foreigners . The tension and almost claustrophobic atmosphere in Moscow are palpable throughout the story. Everyone's listening or being listened to, or followed, everyone the American comes into contact with (other than embassy employees) is either a Russian spy or a traitor to the west, and what begins as a straightforward 'help the brother finish his book' editing effort turns into an exfiltration project. Or does it? I enjoy a good thriller once in a while. But the qualifier matters. Cardboard characters, contrived suspense, and Hollywood cliff-hangers won't cut it. But an espionage novel that hinges on character rather than non-stop action and that provides glimpses of an unfamiliar or exotic world is a great treat. Joseph Kanon's latest, Defectors, fits the bill nicely. It's so good it can be forgiven for some breathless plotting in the final pages. In 1970, I traveled to Scandinavia and the Soviet Union I enjoy a good thriller once in a while. But the qualifier matters. Cardboard characters, contrived suspense, and Hollywood cliff-hangers won't cut it. But an espionage novel that hinges on character rather than non-stop action and that provides glimpses of an unfamiliar or exotic world is a great treat. Joseph Kanon's latest, Defectors, fits the bill nicely. It's so good it can be forgiven for some breathless plotting in the final pages. In 1970, I traveled to Scandinavia and the Soviet Union with a group sponsored by a left-wing lawyers' association. After stops in Stockholm, Helsinki, Leningrad, and Moscow, we flew to Central Asia, where we visited Tashkent, Samarkand, and Bukhara. A lovely, radical sixty-ish couple wasn't on the plane to Uzbekistan with us and didn't rejoin the group when we returned to Moscow before flying home. We were told there was a medical issue although both had seemed hale and hearty in the early going. Knowing their background, I couldn't help but wonder if they had defected. Is that how it would have been done in 1970? I have no idea. But I have thought about them occasionally and tried to imagine what it might have been like for them if they had indeed stayed in the Soviet Union. It's safe to say that their lives would not have been like those of the defectors in this gripping novel. Frank and Simon were close as boys and followed similar career paths, Frank into the CIA, Simon into the State Department. But was Frank using his brother, extracting valuable bits of information in casual conversation over their regular dinners? After Frank's betrayal and twelve years apart, the relationship between the brothers is tense but still intimate as Simon vacillates between trusting and being wary of his charming brother, and he is still drawn to Jo, with whom he had a brief dalliance before she met and married Frank. The fine supporting cast features a woman who once smuggled atomic secrets over a border in her hat, the lonely widow of a brilliant scientist, assorted Brits with assorted motives (including a couple of real-life spies), and Boris – the factotum who is always on hand and always listening. Frank Weeks defected to the USSR shortly after the end of WW2, betraying his country, the CIA and his family in the process. In the early 1960s his brother Simon is invited to Moscow to help Frank edit his memoirs for publication in the USA. On arrival, after being primed by the CIA, Simon is reacquainted with his brother and his brother’s wife (a former lover of Simon himself) and is plunged into a murky maelstrom of intrigue. It soon becomes clear that Frank intends to do rather more than publ Frank Weeks defected to the USSR shortly after the end of WW2, betraying his country, the CIA and his family in the process. In the early 1960s his brother Simon is invited to Moscow to help Frank edit his memoirs for publication in the USA. On arrival, after being primed by the CIA, Simon is reacquainted with his brother and his brother’s wife (a former lover of Simon himself) and is plunged into a murky maelstrom of intrigue. It soon becomes clear that Frank intends to do rather more than publish his memoirs and Simon is envisaged as an essential instrument for his main purpose. Dangerous games with perilous consequences are played to perfection in Defectors. This story of an American CIA agent’s defection during the 1960s is both fascinating and engrossing. In Moscow, the life Frank Weeks leads with his wife and Russian bodyguard Boris is not what I’d expected at all. There are unwritten rules that are never broken and he’s careful not to abuse these publicly, but as he wrote most of them for ‘The Service’ he knows how to shape them to his advantage on occasion. What I f Dangerous games with perilous consequences are played to perfection in Defectors. This story of an American CIA agent’s defection during the 1960s is both fascinating and engrossing. What I found interesting was his sense of purpose within 'The Service', the difference he expects to make regardless of the cost of his own country. When he voluntarily defected he left his brother behind with people asking questions he couldn’t answer. Even though Frank and his wife are officially held captive by his values, they have adopted a stoic performance for anyone who may be watching, listening and reporting their movements. Frank is a curious character. On one hand you’d think him cold-hearted, in fact learning some of his problem solving techniques you’d better believe he is, but when the strains of a personal tragedy affect his wife he is motivated to take extreme action, offering a small glimpse of his personality other than being stamped as nothing more than a traitor. Cue an invitation for Simon, his publicist brother, to join him in Moscow to discuss the draft manuscript of Frank’s memoirs which will set the record straight once and for all. Given the nature of Frank’s position, being a notorious spy, I would have thought that more intimidating powers were likely to object, but he has permission to go public providing he preserve the identities any ‘active’ agents. But even as we follow Frank and a suspicious Simon (complete with the very loyal Boris) around on their meticulously planned sightseeing excursions while something even greater than the memoir is brewing, you never truly get a vivid picture of Frank’s train of thought. There’s always that feeling that he's keeping something back that will never be shared until the end. Adapting to changing circumstances and knowing the shadow of a Russian agent is never far away becomes natural, like breathing. Although it does takes Simon a little longer to adjust during his short stay. Simon’s principles may differ from his brother but a bond remains, where threats and complications are tackled with unflinching spontaneity. Defectors emphasises the human perspective in a story of spies, lies, and family ties, where even the best laid plans can buckle under the weight of the wrong decision and the element of surprise is always two steps ahead. I was impressed by the speed at which the narrative hurtled along while a veiled authority determined the outcome of people's lives with frightening unpredictability. Thanks to the publisher for providing a free review e-ARC via Netgalley. Simon Weeks and his older brother Frank were always together, including during their intelligence work through and after World War II. Frank was with the OSS and transitioned to its successor, the CIA. But all along Frank was a Soviet mole, seduced to the call of communism during the Spanish Civil War. In 1950, like so many spies before him, he defected to the USSR. With such a brother, naturally Simon had to leave his job at Thanks to the publisher for providing a free review e-ARC via Netgalley. With such a brother, naturally Simon had to leave his job at the State Department. He wound up in publishing where, over a decade later he is approached by the Soviets to publish his brother’s memoirs and to come to Moscow to do final editorial work on them with Frank. Naturally, Simon has mixed feelings about the proposal, but in the end he wants to see Frank and Frank’s wife Joanna, Simon’s own girlfriend from long ago. Once in Moscow, Simon sees the bizarrely privileged and yet claustrophobic life of a western defector. Simon himself is under the constant gaze of the KGB and that of the CIA and the western press stationed in Moscow. Then Frank makes a shocking proposition . . . This is not a big action thriller; its thrills are mostly cerebral, as you try to figure out the dizzyingly complex plotting and motivations of all the players and, with Simon, attempt to stay ahead of them all––including his own brother. For a loyal man like Simon, the hardest part is understanding that betrayal is as natural as breathing to those he is up against. There is a famous saying of E. M. Forster: “If I had to choose between betraying my country and betraying my friend, I hope I should have the guts to betray my country.” I always thought this was a deep notion, but in this book Kanon tears it apart. He vividly shows that there is no such choice; that betraying one’s country by spying for another is a betrayal of everything, including friends and family. The Russia of Joseph Kanon's Defectors (Atria, digital galley via NetGalley) is the Soviet Union circa 1961, gray and grim as the Cold War. Even the Party faithful have to wait in long lines for food and depend on the black market for basic amenities. Simon Weeks has often wondered why his older brother Frank, a CIA golden boy, chose to defect in 1949. Was it money, ideology, gamesmanship? Now Frank has written his KGB-approved memoirs and asks Simon, who became a publisher after his brother's d The Russia of Joseph Kanon's Defectors (Atria, digital galley via NetGalley) is the Soviet Union circa 1961, gray and grim as the Cold War. Even the Party faithful have to wait in long lines for food and depend on the black market for basic amenities. Simon Weeks has often wondered why his older brother Frank, a CIA golden boy, chose to defect in 1949. Was it money, ideology, gamesmanship? Now Frank has written his KGB-approved memoirs and asks Simon, who became a publisher after his brother's defection ended his State Department career, to edit the manuscript. Simon discovers his brother is as charming and wily as ever, even though he is accompanied everywhere by a minder, and the restricted, isolated lifestyle has turned his beautiful wife Joanna into an alcoholic. They consort only with other defectors, from famous figures like Guy Burgess to anonymous research scientists. A recent death in the group is presumed a suicide. When Frank begins to show his hand, Simon senses something is up and must fall back on old tradecraft. Betrayal is in the air, murder in a cathedral. “Defectors” a mesmerizing thriller opens in 1961 when Simon Weeks travels to Moscow at the request of his brother Frank, a notorious former CIA agent and defector to the Soviet Union who wants his expertise in completing his memoir before its published in America. Putting aside his bitterness and doubts when they reunite Simon quickly learns that Frank’s wife is a heartbroken drunk after the death of their son Richie; one of the aging defectors in their community mysteriously committed suicide; “Defectors” a mesmerizing thriller opens in 1961 when Simon Weeks travels to Moscow at the request of his brother Frank, a notorious former CIA agent and defector to the Soviet Union who wants his expertise in completing his memoir before its published in America. Putting aside his bitterness and doubts when they reunite Simon quickly learns that Frank’s wife is a heartbroken drunk after the death of their son Richie; one of the aging defectors in their community mysteriously committed suicide; and that his brother has a plan to trade information to the CIA in exchange for refuge and protection in the United States. Set in the paranoid atmosphere of the Cold War, the plot quickly heats up as plans filled with lies, secrets and betrayal test the brothers’ loyalty. Fast-paced and intense the suspense quickly escalates when Frank’s plan is compromised with an unforeseen murder and his timetable has to be accelerated. With shocking twists as duplicity and distrust increase, emotions intensify when new players are introduced in an ever-changing game of intrigue and as Frank’s KGB bodyguard becomes suspicious of Simon’s real objective. A page-turner from beginning to end, Joseph Kanon infuses the plot with strong, complex and realistic characters that fire your imagination. Simon Weeks plagued with a traitor in his family and a adulterous wife seems naïve, open and honest until he begins to shed his mask with his own schemes and complicity in a murder. In contrast, his brother Frank a hero and officer in the Soviet Union is a charismatic spy who’s cold, calculating and perceptive; his duty and politics at odds with his love and loyalty to his wife and brother. This Russian spy story is cleverly conceived and expertly conveyed to allow the reader to imagine the circumstances leading to brotherly deceptions. From the start of the book I was focused on the relationship of the two brothers rather than the ideological differences. On the one hand, the older American brother defected to Russia in 1949 and now serves as officer in the KGB and has written a book the Service approves of. The younger brother had to establish himself away from his previous work for the state department and manages to succeed as a book publisher. Thus the opening of the game. This is Russia in 1961... CIA vs KGB. Believable events paced with the right amount of tension keeps you reading to the end. Very compelling read, my first of this author's work. I am going to try to recommend this to my brother, a former spy whose Russian is impeccable. Whoops. He uses his real name on this site, so I guess I will have to notify him by email. This was, indeed, a fascinating view of life behind the Iron Curtain for Western agents for the Soviets who defected (voluntarily or involuntarily) to the Soviet Union. I have a great fascination for the Cold War, but have never read about this small subset of westerners living out their lives behind the Iron Curtain. They had more privileges than most citizens, but the surveillance never, ever stopped. At this point in time, I seldom read spy stories, but I do think this is an excellent example This was, indeed, a fascinating view of life behind the Iron Curtain for Western agents for the Soviets who defected (voluntarily or involuntarily) to the Soviet Union. I have a great fascination for the Cold War, but have never read about this small subset of westerners living out their lives behind the Iron Curtain. They had more privileges than most citizens, but the surveillance never, ever stopped. Held my interest, and of interest as it explored and illuminated what U.S. defectors to Russia mindsets may have been like, and explains their possible motives. Book takes place in same era as Burgess and McLean defections to Russia. Our subject defector takes his wife and small son with him. The son dies of illness, and poor wife is left at wit's end but loyal to her husband. Suspense and mystery at the end, and I must admit a surprise ending, but does not quite reach the pitch it might have. A perfect crescendo and climatic conclusion to a story about the defector community in post WWII Soviet Union where those once valued are relegated to "kept" status and rationalize their life altering decisions. This is also a story of two competitive brothers who cannot escape the influence and approval of their parents (especially the father). In a life of lies, deception, and uncertain loyalties, it is difficult to know the truth about anything including oneself which is certainly a tragedy. This is the third book I've read by Kanon, and I liked it the best. The interaction between two brothers, who share a history that in itself is conflicting, makes for a great human interest story within the confines of the espionage plot. How quickly we forget other Russian incidents, but thanks to Kanon, we're reminded of Gary Powers, Burgess, Rosenbergs and others. So, a mini-history lesson as well. Kanon is at the top of his game with "Defectors." Cat-and-mouse, betrayers and betrayed, agent and double agent, espionage, spies, intelligence and counter intelligence, infiltrate and exfiltrate. Frank Weeks, a former American citizen who was successfully recruited by Russia during the cold war, now lives in Moscow with his wife Jo. They live a not-exactly-free, although comfortable, life. Frank is writing his memoirs, detailing his life during the cold war. His brother, Simon, a publisher, has come to Russia to meet with Frank, to finalize th Cat-and-mouse, betrayers and betrayed, agent and double agent, espionage, spies, intelligence and counter intelligence, infiltrate and exfiltrate. Frank Weeks, a former American citizen who was successfully recruited by Russia during the cold war, now lives in Moscow with his wife Jo. They live a not-exactly-free, although comfortable, life. Frank is writing his memoirs, detailing his life during the cold war. His brother, Simon, a publisher, has come to Russia to meet with Frank, to finalize the book. Joseph Kanon weaves a masterful tale which leaves the reader at times breathless and at times in awe. I am so into Spy novels. Mitch Rapp, and Jack Ryan are two of my favorite characters in the genre. I was thrilled when I received a copy of Joseph Kanon's Defectors to review. What could be better than a spy novel set in Russia during the meat of the Cold War? Little else, let me tell you. Little else. Frank Weeks once worked with the U.S., in the C.I.A., as a spy. Something happened to his position on life, and he turned. He defected to Russia and gave up American secrets, and shared information I am so into Spy novels. Mitch Rapp, and Jack Ryan are two of my favorite characters in the genre. I was thrilled when I received a copy of Joseph Kanon's Defectors to review. What could be better than a spy novel set in Russia during the meat of the Cold War? Little else, let me tell you. Little else. Frank Weeks once worked with the U.S., in the C.I.A., as a spy. Something happened to his position on life, and he turned. He defected to Russia and gave up American secrets, and shared information with the enemy. Decades later, and while semi-retired, he decided to pen his memoirs. He felt questions about his past needed answering. Of course the rough draft had to be approved by the Russians. And since Frank's brother, Simon, works with a publisher, he decides there is no one better to than Simon for the editor position. There is one condition, Simon needs to come to Russia so they can work on the manuscript together. Not to mention, he hadn't seen his brother in countless years. This would give them a perfect opportunity to catch up. When Simon gets to Russia it is almost immediately clear that Frank is up to something. He knows details about his brother's personal life --his marriage to Joanna, and what happened to their son Richie-- but he can't help feeling like there is something more behind every word Frank speaks. What is Frank really up to? Is this visit all about editing the memoirs --which will bring in a fortune to Simon's publishing company-- or is something more at work? Is there a plot at hand, and Simon a mere pawn in another of Frank's games? Doing anything even remotely illegal in Russia would constitute a lifelong prison sentence at best, and Simon's execution in the worst case scenario. But Frank is his brother . . . how can he not help his brother? Almost a slow-burn thriller, at first. The plot is put into place. The players are expertly outlined. The history is unveiled, and the outcome of the future of the Weeks brothers is set in motion ... and then Kanon kicks up the tension, the action, and the suspense as everything around the Weeks explodes with danger. Who can be trusted? No one. Their spies. This is their lives. These are the games spies play ... and Simon, he just wants to get home safely --unfortunately, that may be asking too much!